President Muhammadu Buhari on Tuesday departed Abuja for London, the United Kingdom on yet another medical trip. This is just as the Peoples Democratic Party alleged that the President is unfit to continue in office. The President’s security officials and a few close aides accompanied him on the trip. The presidential aircraft marked 5N-FGW which conveyed the President left the airport at about 3.20pm. Those who saw the President off to the airport included his Chief of Staff, Abba Kyari; the Minister of Federal Capital Territory, Alhaji Muhammad Bello, and the Inspector-General of Police, Ibrahim Idris. The Senior Special Assistant to the President on Media and Publicity, Garba Shehu, had in a statement on Monday, announced that Buhari would on Tuesday embark on a four-day medical trip to the UK. Shehu had said the President would return to the country on Saturday. The statement read, “President Muhammadu Buhari will tommorrow (Tuesday) undertake a four-day trip to the United Kingdom. “The doctor requested the President to return for a meeting which he agreed to do..."
However, the National Publicity Secretary of the PDP, Mr. Kola Ologbondiyan, who spoke at a press briefing in Abuja on Tuesday, wondered why the Presidency was shrouding the health of the President in secrecy. 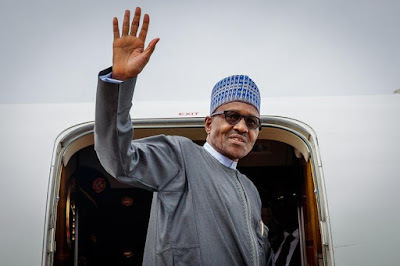 He said, “The Peoples Democratic Party notes the confirmation of the Presidency that President Muhammadu Buhari is unwell, ailing and unfit to attend to state matters, resulting to his latest journey to the United Kingdom for medical attention. “This admission, though belated and coming after intense public pressure, has now put to rest speculations and anxiety on the health status of the President, as well as his attendant inability to effectively govern. Ologbondiyan said that the PDP had in April, shortly before the Commonwealth Heads of Government Meeting, the President undertook a private visit to the UK, where his doctors reside. He said that the President was there five days ahead of CHOGM, without telling Nigerians his itinerary. Ologbondiyan said, “When concerns began to mount on his whereabouts, the Presidency claimed he had a ‘technical stop-over’ in the UK, citing flight issues. He knocked the President for embarking on medical tourism abroad when his administration had completely refused to address the poor state of the health sector in Nigeria, for which medical workers are currently on strike across the nation.